Do the best we can to make sure a match goes ahead. Take as much work away from the manager(s) as possible. The reminders system is good at achieving 1 and 2, but often at the expense of 3. From today we're giving control back to the managers! 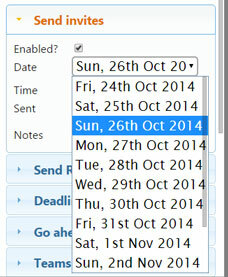 You can disable the booking reminder, the deadline reminder, whatever you want. Football being cancelled for a weeks? You can disable all the reminders if you want! 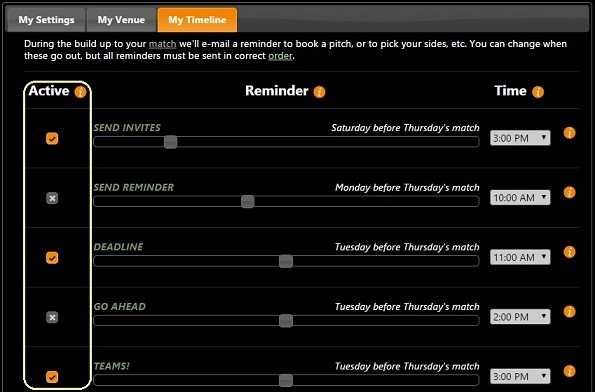 Naturally you can disable reminders on a per-match basis too. But don't come crying to me when players drop out last minute because they forget they'd put their name down . On the subject of reminders, disabling is available on mobile devices too. Another little tweak is we'll only show the next few days for when your reminder should go out. Much better than having to select day, month and year separately ! The first cut of the side picker for mobile was a good start, but needed some more work. 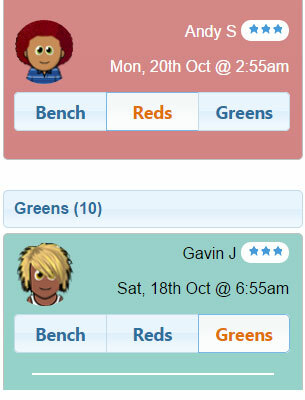 Instead of lots of dropdowns, you can pick your teams with buttons, which is much, much easier. The player won't move between sides until you Save. If they did, they'd be jumping around all over and it would be more confusing. As you can see, the background of the team represents the shirt colours worn. Once you've rated your team we'll show you the ratings as they stand. The links at the bottom of page are much bigger, you couldn't easily see what they said! Any notes against a player are shown in the profile area of the side picker screen. On the squad membership screen, managers can put a note against a player, e.g. You still owe £5. But on the version your players see the notes aren't displayed! This has now been fixed - players will only see notes directed to them! Add a new link to the home page on the menu, as well as the logo. Fix for iPhones on the menu screens - the right hand ones were floating underneath the left ones. These should now line up horizontally. Minor fix to the paging links which had a weird white block between pages. 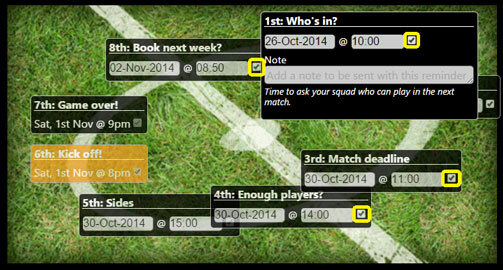 Past matches were not showing all reminders that had been processed (to Managers). The gravatar.com on side picker screen could be huge when using a mobile device. Sometimes maps weren't being displayed on the squad browser. An error would be generated when clicking a hyperlink to a match that had been cancelled.